Back in 1988, when I was 10 years old, I had a pocketful of allowance money when I walked into the local pharmacy looking for a way to spend it. My go-to item was always the stuffed animals or their somewhat miserable supply of Barbies, but I hadn't saved up and therefore had to hunt for something a little closer to the $5 bill clutched in my fist. So I headed to the books and periodicals section. I was an avid reader, maybe they had a Baby-sitters Club book I didn't have? As I was looking around something colorful caught my attention. A small book the size of a paperback but shaped a little fatter, a little shorter. On the cover was a cartoon of a father and son having a discussion about homework. The father says, "Archie, how do you explain this low math grade?" and the son replies, "Well, dad! How about the batteries in my calculator went dead!" HA! I use a calculator too! I started to flip through the pages and was captivated by charm of the 1950's style of fashion. And the characters in the stories were all teenagers! They went on dates and drove cars and threw parties! The advertising throughout the book also appealed to me. Ads for Fruity Pebbles, M&M's, and Chips Ahoy. I like those things! I like all of those things! The price on the cover was only $2.25. I would still have money left to buy candy. SOLD. 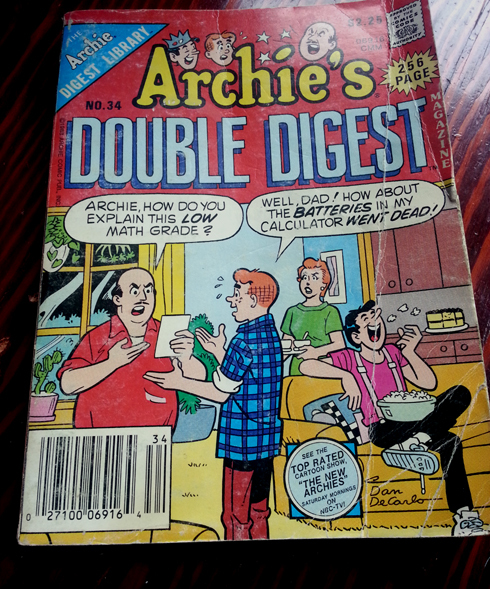 Thus began my collection of Archie Digest Magazines. I would stay up past my bedtime reading by the illumination of a flashlight. But there was no fooling mom, she would walk past by bedroom and as I quickly tucked the light under the covers she would say, "Heather Marie! Lights out." Pretty soon I had a tall stack of Archie comics on the floor next to my bed. I would read them over and over again. Knowing each one cover to cover. I loved visiting Riverdale. It was a small, safe town that was always idyllic. 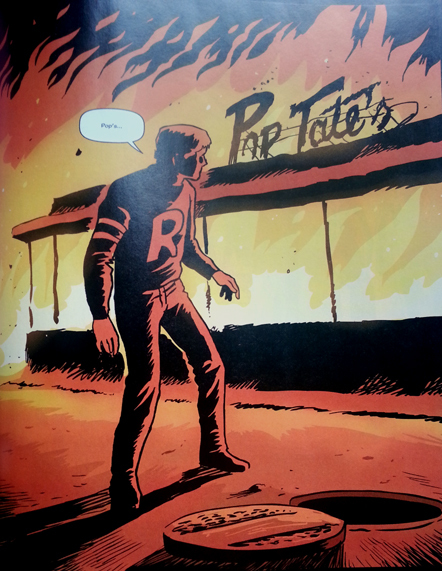 The gang would get into zany mischief at Riverdale High and then go hang out after school at Pop's Soda Shop. 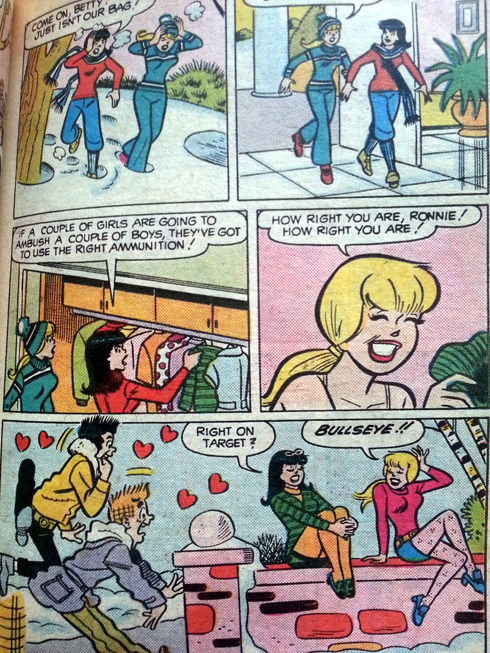 Betty and Veronica always fought over Archie and Archie loved them both, in different ways, and could never make up his mind. 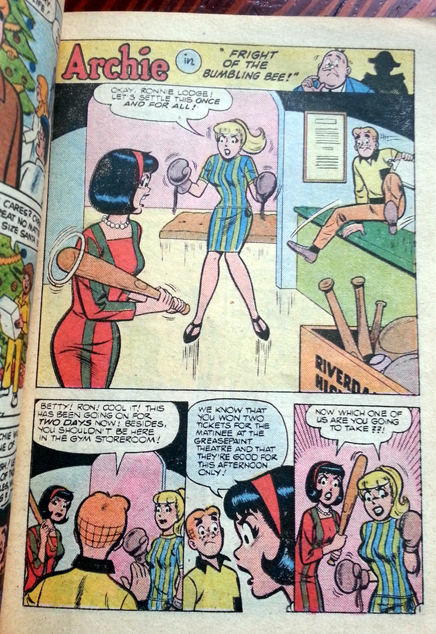 Reggie loved Veronica and would always concoct villainous plans to steal her from Archie. And sometimes they worked. Moose, the big dumb lug, loved Midge. And Midge, despite his jealousy, loved Moose. Jughead loved food. A lot. 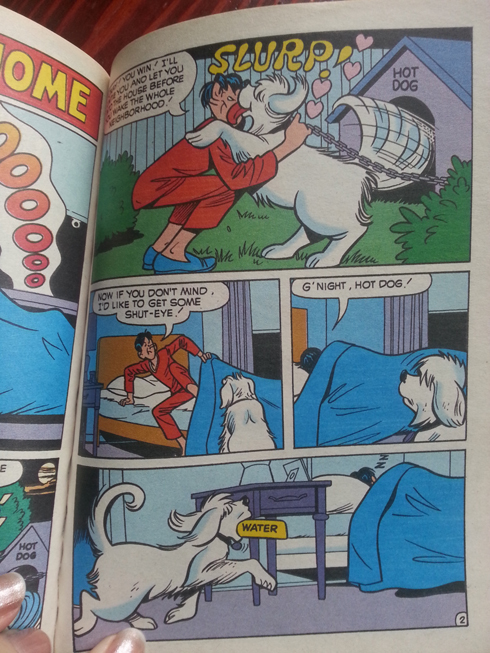 And Ethel loved Jughead. A lot. But through the thick and thin of it, all of them were the best of friends. No matter what. Eventually, like all things, I grew up. My desire to visit Riverdale every night waned. Soon I was perusing the books in the horror section of the bookstore and spending my money on the likes of Christopher Pike. I traded in nights of small town hijinks for ones of murders and mysteries. But I never stopped loving the Riverdale gang. And for 26 years I've carted my collection of Archie comics from state to state, house to house, room to room. 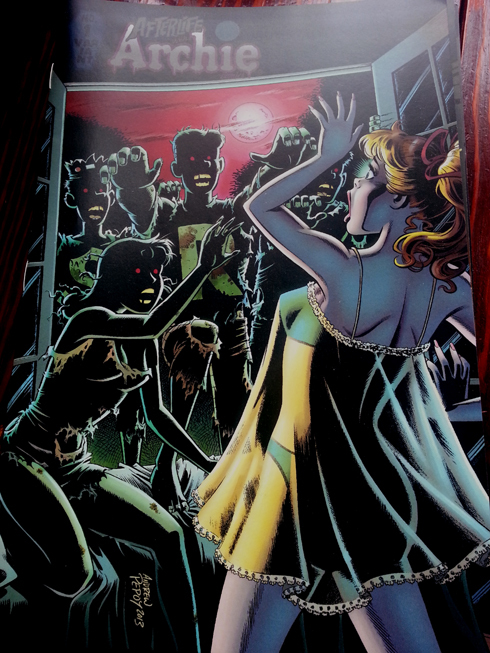 The first issue was read with eagerness and trepidation, for I knew that the cost of joining Archie and Zombies would be that some of my beloved friends would die. 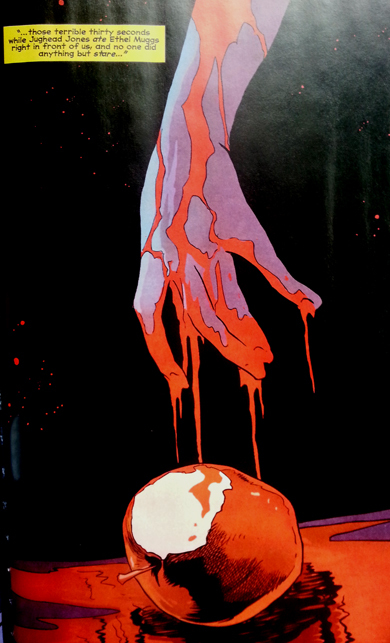 And sure enough, from the first pages bled a horrific accident, taking the life of one of our nearest and dearest. And so we turn to another Riverdale teen, Sabrina, the teenage witch, to see if we can't turn the tides a little and resurrect the dead. And it works, with terrible consequences. The dead came back... wrong. 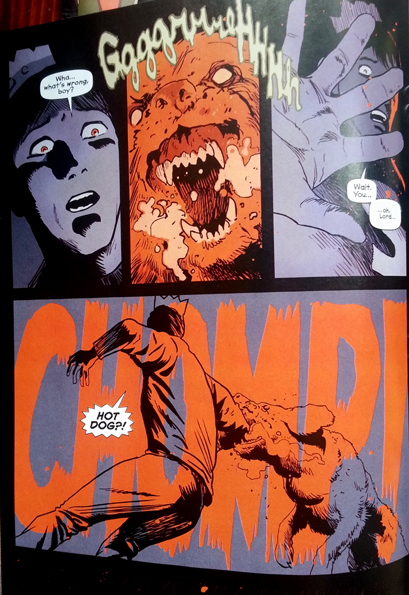 Soon, this curse begins to spread through bites and blood, taking our Riverdale family down, one by one, and setting fire to the town. Watching it burn. Watching them hide. Desperate. Scared. Heartbroken. With every new issue the stakes are raised just a little as the zombie population grows and our friends make hard choices. 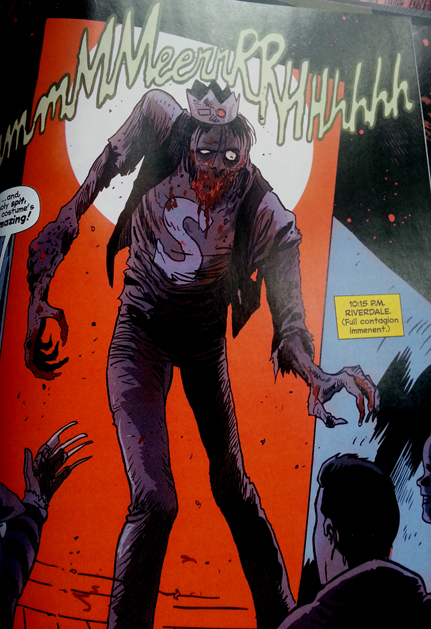 No matter your opinion of Archie comics or zombies, this book is far from schlocky. 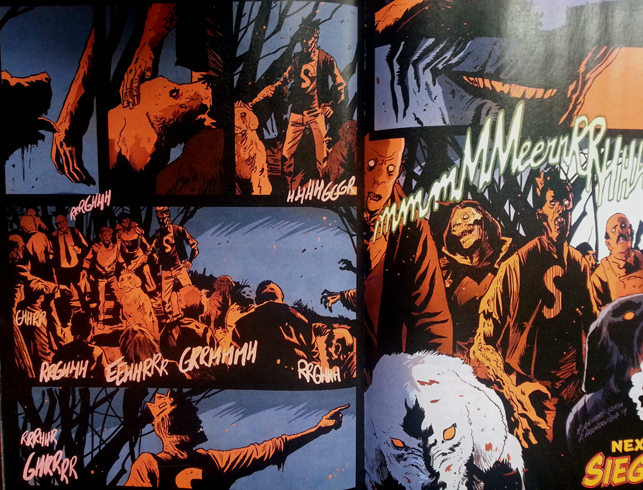 And I cried while reading the 4th, and most recent issue. Because they get you where it hurts. Going after the elements of our childhood that made us feel safe, our homes, our parents, our pets, our friends, our school. They slaughter them all, setting fire to your life and watching you run, as they laugh and plot more ways to destroy you. And I love every page of it. As childhood falls away and the skies turn dark. My heart quickens. Palms sweat. And as I smile I can taste the salty tears catching in the corners of my mouth.